YouTube is without doubt one of the Internet's best platforms, but it does have its weaknesses, particularly when it comes to monetizing controversial content. Using BitTorrent under the hood to avoid expensive bandwidth bills, could the recently launched BitChute become a viable alternative? YouTube attracts over a billion visitors every month, with many flocking to the platform to view original content uploaded by thousands of contributors. However, those contributors aren’t completely free to upload and make money from whatever they like. Since it needs to please its advertisers, YouTube has rules in place over what kind of content can be monetized, something which caused a huge backlash last year alongside claims of censorship. But what if there was an alternative to YouTube, one that doesn’t impose the same kinds of restrictions on uploaders? 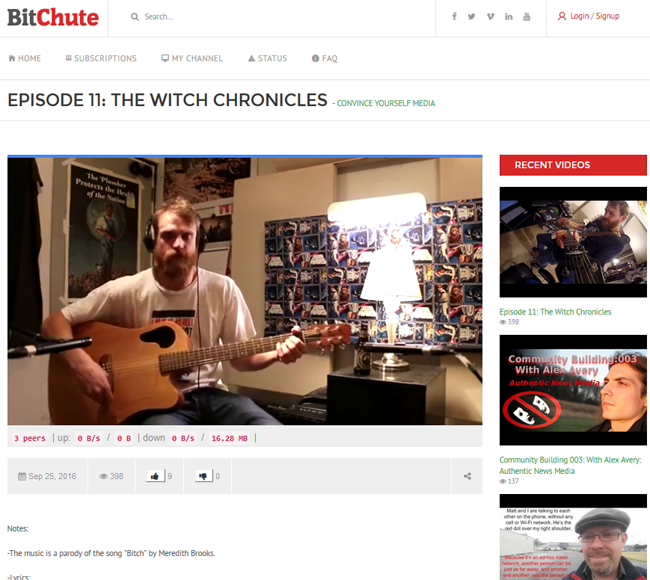 Enter BitChute, a BitTorrent-powered video platform that seeks to hand freedom back to its users. “The idea comes from seeing the increased levels of censorship by the large social media platforms in the last couple of years. Bannings, demonetization, and tweaking algorithms to send certain content into obscurity and, wanting to do something about it,” BitChute founder Ray Vahey informs TorrentFreak. As seen in the image below, the site has a familiar layout for anyone used to YouTube-like video platforms. It has similar video controls, view counts, and the ability to vote on content. It also has a fully-functioning comment section. Of course, one of the main obstacles for video content hosting platforms is the obscene amounts of bandwidth they consume. Any level of success is usually accompanied by big hosting bills. But along with its people-powered philosophy, BitChute does things a little differently. Instead of utilizing central servers, BitChute uses WebTorrent, a system which allows people to share videos directly from their browser, without having to configure or install anything. Essentially this means that the site’s users become hosts of the videos they’re watching, which slams BitChute’s hosting costs into the ground. “Distributed systems and WebTorrent invert the scalability advantage the Googles and Facebooks have. The bigger our user base grows, the more efficiently it can serve while retaining the simplicity of the web browser,” Vahey says. The only hints that BitChute is using peer-to-peer technology are the peer counts under each video and a short delay before a selected video begins to play. This is necessary for the system to find peers but thankfully it isn’t too intrusive. As far as we know, BitChute is the first attempt at a YouTube-like platform that leverages peer-to-peer technology. It’s only been in operation for a short time but according to its founder, things are going well. “As far as I could tell, no one had yet run with this idea as a service, so that’s what myself and few like-minded people decided. To put it out there and see what people think. So far it’s been an amazingly positive response from people who understand and agree with what we’re doing,” Vahey explains. “Just over three weeks ago we launched with limited upload access on a first come first served basis. We are flat out busy working on the next version of the site; I have two other co-founders based out of the UK who are supporting me, watch this space,” he concludes. Certainly, people will be cheering the team on. Last September, popular YouTuber Bluedrake experimented with WebTorrent to distribute his videos after becoming frustrated with YouTube’s policies. For now, BitChute is still under development, but so far it has impressed Feross Aboukhadijeh, the Stanford University graduate who invented WebTorrent. BitChute can be found here.